At a quarter past twelve last Thursday afternoon, February 28, Jake Webb received a phone call. By that same night, he was on a flight to Nauru. It was a trip Webb hadn’t even planned for – the phone call, from AFL Queensland State Umpiring Manager James Waldorff, was answered while he was halfway through a normal working day. The quick turnaround didn’t leave Webb much time to ponder the decision, let alone pack for a once in a lifetime experience. But alas, with the blessing from his boss to leave work early and passport number sent via text from his mum, Webb was on the way to the airport. Only seven months ago, Webb was making his NEAFL umpiring debut – a clash between Redland and Sydney at Coorparoo’s Giffin Park. This time, the stakes were different. Webb was en route to Nauru to officiate the AFL Nauru Independence Cup Grand Final to celebrate the country’s 50 years of independence. “I was a bit nervous and excited at the same time. As soon as my boss said I could go, I was pumped. I was running around all afternoon,” Webb told aflq.com.au. Webb arrived at Nauru’s International Airport on Friday afternoon – 2pm Brisbane time – and was greeted by several handshakes form the local Nauruan population; recognisable by the AFL logo that appeared on his shirt. While not really knowing what to expect, Webb knew the trip was different when the drive from the airport to the hotel was made sitting in the tray of a ute. “That was my first initial thought when they said, ‘you’ve got a seat in the tray,’” he said. “I thought, hang on, this is a little bit different. We were sitting in the tray with around eight other people. 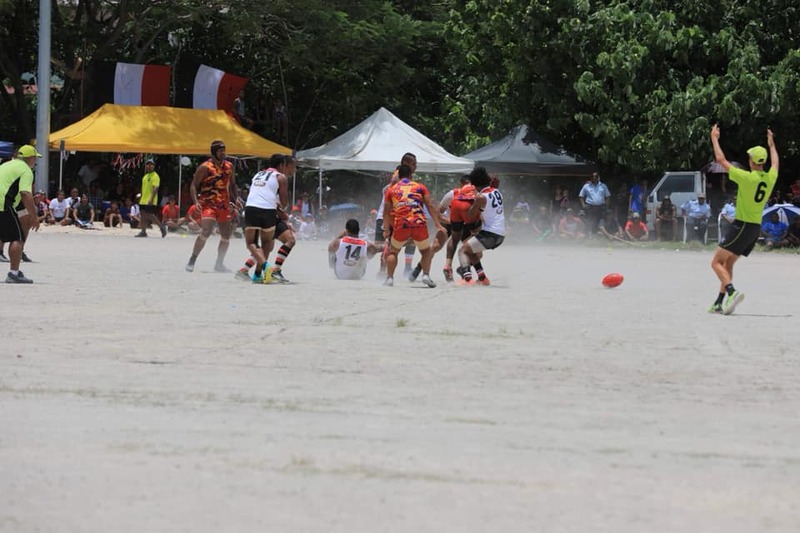 The two Grand Finals were scheduled for Saturday, played between the Boe Lions and Panzer Saints (senior) and Panzer Eagles and Esso Tigers (reserves) at the nation’s Linkbelt Oval – the only Australian Rules ground on the island and traditional home of the Tigers. The Oval where Webb would be umpiring wasn’t one of grass either, but instead covered in phosphate. Markings on the field were also different; made not with paint, but with oil that was smeared onto the rock surface. “It was literally hard rock,” Webb said. But while Nauru was a far cry from Webb’s usual experiences umpiring QAFL and NEAFL football, one thing that stood out to him was how embracive the Nauruan population were to the sport of Australian Rules football. 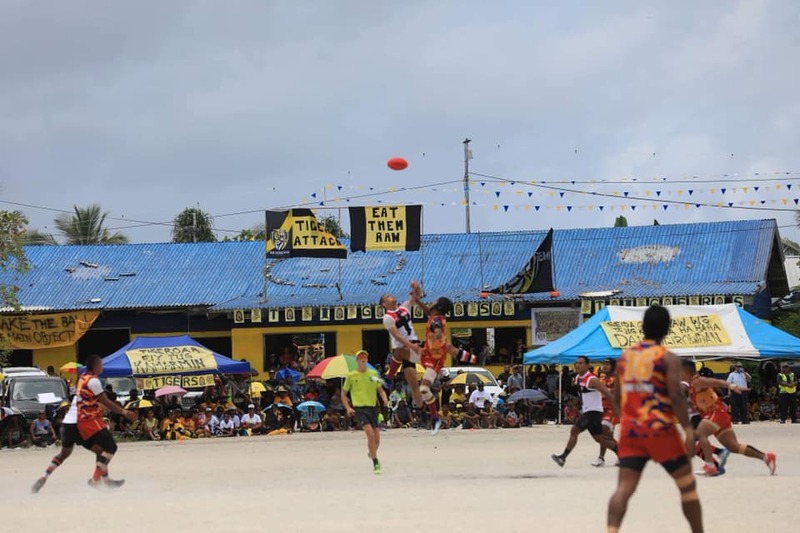 Around 2000 of the island’s 11,000 people turned out to witness the Grand Finals and most went out of their way to extend a welcome and thank you to Webb. “The passion from the fans the players leading up to the game was amazing. It pumped me up at the same time as well just looking at everyone,” he said. “When I arrived Saturday morning, the players and even the officials came over and had a chat with me. We talked about the game and they asked where I was from. “They made me feel like I was a local. I felt like I knew everyone, and everyone knew me. With nerves out of the equation, Webb went about officiating like any other game – the biggest and perhaps only issue was the heat. Fans lined the oil markings at the edge of the ground, most decked out in team gear. Stereos were set up at either end of the ground – blaring music whenever a goal was kicked. Of course, the footy-mad fans soon reverted not just to blaring music after a goal was scored but any time the ball would move into their half of the field. The resulting atmosphere was loud but highlighted just how much Nauru enjoyed their national sport which is played by approximately 30% of the country’s population. The Esso Tigers were victorious in the reserve grade while the Panzer Saints claimed the premiership in the senior division. Webb returned to Australia on Sunday afternoon having lived out the wildest of any umpire’s dream. But it wasn’t the umpiring that made the trip the experience of a lifetime for Webb – the thing that he remembers most is the people. AFL South Pacific Development Manager Ben Drew extended his thanks to the AFL Queensland Umpiring Department for their help. AFL Nauru is an affiliate of the AFL and operates several programs to participants including Ausick, school and community football training and youth and senior club football. Women’s football has also seen growth on Nauru, with regular exhibition matches taking place over the past two years and an increase in young girls participating in Auskick and community programs. AFL Nauru is supported through the Australian Government’s Pacific Sports Partnership and partner with the Nauru Public Health Department to help tackle diabetes, smoking and promote healthy lifestyles. Main image: Jake at the toss of the coin with Acting President. Minister for Justice and Finance, the Honourable Mr David Adeang.